Every once in a while I come across a recipe I want to make, but it requires a whole other prepared food as an ingredient. 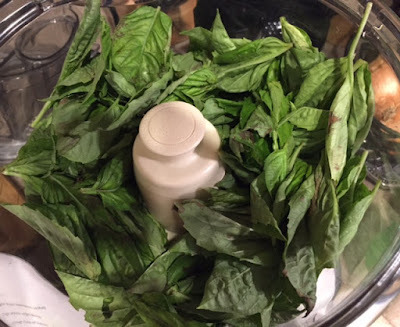 Pesto is a common example of a recipe within a recipe. I've not found a good store bought paleo pesto, so I decided it was high time to make some paleo pesto. As with most basic recipes, I turn to Melissa Joulwan first as she tends to have really good recipes for the basics we all look for. After a quick Internet search, I found her Paleo Pesto. Here are the main ingredients. This recipe doesn't present much opportunity for photos. The longest part of the preparation is packing the measuring cups with basil. After measuring, I dumped all of the ingredients in to my food processor. You give it all a good blitz, and there you have it, Pesto! I think it may be impossible to get pesto to look nice in a picture. Accessibility & Cost of Ingredients: I was lazy and used Instacart to get my groceries delivered to me from Whole Foods, so I paid a little too much for basil. If I had more time, I would have gone to the Asian market where huge bunches of super fresh basil are super cheap. The pine nuts were $13.99 for an 8oz bag. If I went to the store and bought in bulk, again, it would have been more economical. 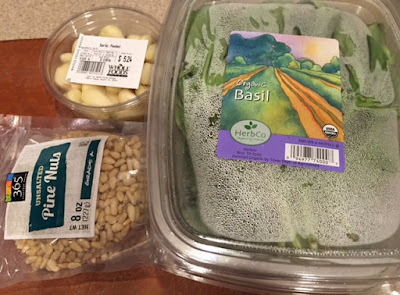 Most big box stores have fresh basil and pine nuts. She does give the option of using walnuts as well which may be easier to find. Preparation Time: I did not even say cooking here as there is no cooking. It took me 15 minutes start to finish to prepare this pesto. Clean up: I threw everything in the dishwasher! Presto! The Paleo Review: Thumbs Up! 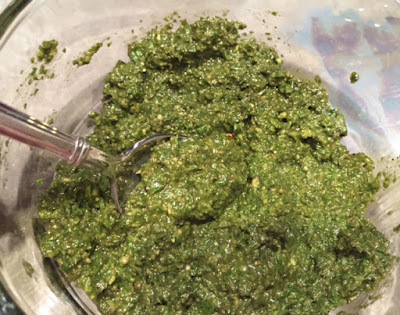 Who needs cheese to make pesto? I certainly don't. This tasted fantastic. I could totally see using this as a dip for raw veggies or a topping for a chicken breast or even salmon. I saved the majority of this for another recipe. This is so quick and easy, it will be a new standard in my house.